Providing you the best range of dcp type fire extinguisher, co2 type fire extinguisher, mechanical foam type fire extinguisher and abc type fire extinguisher with effective & timely delivery. 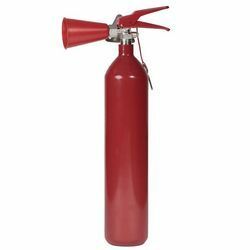 DCP Type Fire Extinguisher consists of a hand-held cylindrical pressure vessel containing an agent which can be discharged to extinguish a fire. Fire extinguishers manufactured with non-cylindrical pressure vessels also exist but are less common. The extinguisher is cylindrical in shape, made of the solid drawn steel cylinder. The nozzle is protected with a rubber cap against the entry of moisture. The excellent is C02 gas in a cartridge which is sealed. 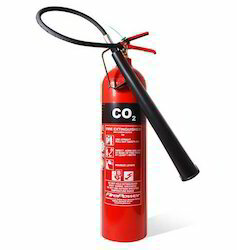 CO2 Type Fire Extinguisher are ably designed with the aid of latest technology to easily knock down fire involving flammable liquid, like paints, oil, varnish, solvents, and even industrial gases. 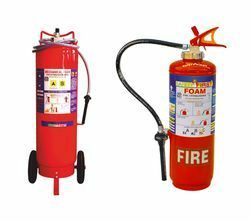 We are offering the best quality of Mechanical Foam Type Fire Extinguisher to our customers. Available in varied sizes, compositions, and specifications, the range can be acclaimed in suspended BC, ABC dry powder, CO2 AFFF, clean water and varied other forms, as per the clients' requirement. Steam generation is useful for smothering. Foam is used against fire in oil surfaces. The extinguishing effect is smothering and inhibiting. 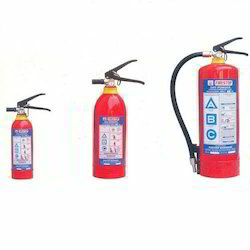 ABC Type Fire Extinguisher is used for putting off a fire and these Fire Extinguisher are used in all the residences and in the offices for safety purposes.